Have you ever dreamed of having your own little cabin out in the woods and living the primitive life of a mountaineer? Well, maybe that sort of dream isn’t exactly possible for most of us with our complex, modern lives, but you can bring a little bit of that classic, primitive existence into your home, with this old-fashioned “wood-burning” stove-style fireplace. The best thing about it is that it actually doesn’t burn wood at all, so you’ll never have to worry about the smoke, ashes, fuel cost, or inherent environmental-unfriendliness of such an arrangement. Have your cake and eat it to with this lovely vintage fireplace that allows you to relive the past. The “logs” in this model are very realistic and give a convincing look that completes the illusion of this classic fireplace. The flames dance around on the inside of the hearth in a similar way as real life fire, which makes it great for those nights when you simply want to sit down and relax in front if some crackling embers. They are fully three-dimensional and put on an authentic show. It does have a fan of course to push the warm air out of the heater, but it is extremely quiet so as to not disturb your serenity. This makes it a great heater to use when you’re relaxing just before bed, or even as you’re falling asleep. This unit can heat a small room of up to 400 square feet, and features a high and low setting so that you never have to worry about wasting energy. The best part is that you can control the heat with a simple flick of a switch. This sure beats having to stoke a fire. Other electric fireplaces may come with huge mantel (or no mantels at all – wall mounted electric fireplaces) that require you to lug them from room to room if you’re looking to switch things up. Luckily, this piece will not turn into another burdensome piece of furniture as it is truly lightweight and portable at just under 30 lbs. As mentioned, this fireplace is an absolute winner when it comes to aesthetics. It features realistic flames inside a classic stand-alone mantel, and two beautiful glass doors in front of the hearth. You can place it pretty much anywhere in your home and it will look great. 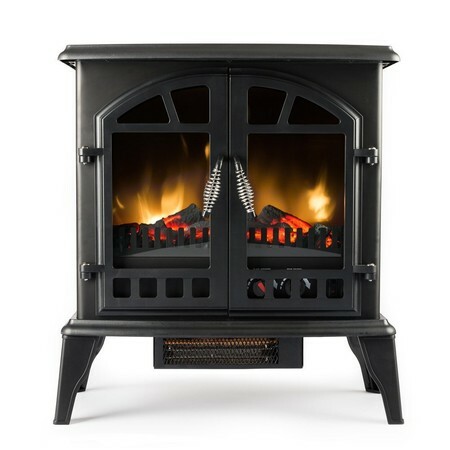 It would look particularly good in the kitchen or living room, or other traditional locations for this style of stove. Whether you’re decorating your mountain cabin or just your urban living room, this beauty is sure to please and bring some vintage flare to your home. – 25 x 11 x 23 inches in size. – 29.6 pounds in weight.